This article is about the type of film. For films named "Feature" or variation, see Feature (disambiguation). Not to be confused with featurette. A feature film or theatrical film is a film (also called a motion picture or movie) with a running time long enough to be considered the principal or sole film to fill a program. The term feature film originally referred to the main, full-length film in a cinema program that also included a short film and often a newsreel. The notion of how long a feature film should be has varied according to time and place. According to the Academy of Motion Picture Arts and Sciences, the American Film Institute and the British Film Institute, a feature film runs for at least 45 minutes (​3⁄4 of an hour), while the Screen Actors Guild asserts that a feature's running time is 75 minutes or longer. Most feature films are between 75 and 210 minutes long. The first narrative feature film was the 60-minute The Story of the Kelly Gang (1906, Australia). The first (proto)-feature-length adaptation was Les Misérables (1909, U.S.). Other early feature films include The Inferno (L'Inferno) (1911), Defence of Sevastopol (1911), Quo Vadis? (1913), Oliver Twist (1912), Richard III (1912), From the Manger to the Cross (1912) and Cleopatra (1912). The Academy of Motion Picture Arts and Sciences, the American Film Institute, and the British Film Institute all define a feature as a film with a running time of 2,700 seconds (i.e. 45 minutes) or longer. The Centre National de la Cinématographie in France defines it as a 35 mm film longer than 1,600 metres (5,200 ft), which is exactly 58 minutes and 29 seconds for sound films, and the Screen Actors Guild gives a minimum running time of at least 75 minutes. 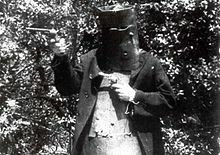 Actor playing the Australian bushranger Ned Kelly in The Story of the Kelly Gang (1906), the world's first dramatic feature-length film. The term feature film came into use to refer to the main film presented in a cinema and the one which was promoted or advertised. The term was used to distinguish the longer film from the short films (referred to as shorts) typically presented before the main film, such as newsreels, serials, animated cartoons, live-action comedies, and documentaries. There was no sudden increase in the running times of films to the present-day definitions of feature-length; the "featured" film on a film program in the early 1910s gradually expanded from two to three to four reels. Early features had been produced in the United States and France, but were released in individual (short film) scenes. This left exhibitors the option of playing them alone, to view an incomplete combination of some films, or to run them all together as a short film series. Early features were mostly documentary-style films of noteworthy events. Some of the earliest feature-length productions were films of boxing matches, such as The Corbett-Fitzsimmons Fight (1897), Reproduction Of The Corbett-Jeffries Fight (1899), and The Jeffries-Sharkey Fight (1899). Some consider the 100-minute The Corbett-Fitzsimmons Fight to be the first documentary feature film, but it is more accurately characterized as a sports program as it included the full unedited boxing match. In 1900, the documentary film In the Army was made. It was over one hour in length and was about the training techniques of the British soldier. Inauguration of the Australian Commonwealth (1901) ran for 35 minutes, "six times longer than any previous Australian film", and has been called "possibly the first feature-length documentary made in Australia". The American company S. Lubin released a Passion Play titled Lubin's Passion Play in January 1903 in 31 parts, totaling about 60 minutes. The French company Pathé Frères released a different Passion Play, The Life and Passion of Jesus Christ, in May 1903 in 32 parts running about 44 minutes. Defined by length, the first dramatic feature film was the Australian 70-minute film The Story of the Kelly Gang (1906). Similarly, the first European feature was the 90-minute film L'Enfant prodigue (France, 1907), although that was an unmodified record of a stage play; Europe's first feature adapted directly for the screen, Les Misérables, came from France in 1909. The first Russian feature was Defence of Sevastopol in 1911. Early Italian features were The Inferno (L'Inferno) (1911), Quo Vadis? (1913), The Last Days of Pompeii (1913), and Cabiria (1914). The first UK features were the documentary With Our King and Queen Through India (1912), filmed in Kinemacolor and Oliver Twist (1912). The first American features were adaptations of Oliver Twist (1912), From the Manger to the Cross (1912), Cleopatra (1912), and Richard III (1912). The latter starring actor Frederick Warde starred in some of these movie adaptations. The first Asian feature was Japan's The Life Story of Tasuke Shiobara (1912), the first Indian feature was Raja Harishchandra (1913), the first South American feature was Brazil's O Crime dos Banhados (1913), and the first African feature was South Africa's Die Voortrekkers (1916). 1913 also saw China's first feature film, Zhang Shichuan's Nan Fu Nan Qi. By 1915 over 600 feature films were produced annually in the United States. It is often incorrectly cited that The Birth of a Nation (1915) was the first American feature film. The most prolific year of U.S. feature production was 1921, with 682 releases; the lowest number of releases was in 1963, with 213. Between 1922 and 1970, the U.S. and Japan alternated as leaders in the quantity of feature film production. Since 1971, the country with the highest feature output has been India, which produces a thousand films in more than twelve Indian languages each year. A poster for The Jazz Singer (1927) the first feature film to use recorded sound. 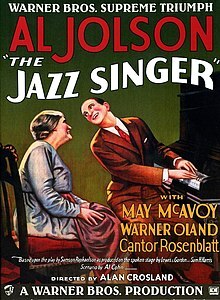 In 1927, Warner Bros. released the first feature-length film with sound, The Jazz Singer, whose audio track was recorded with a proprietary technology called Vitaphone. The film's success persuaded other studios to go to the considerable expense of adding microphones to their sets, and scramble to start producing their own "talkies". One of the next major advancements made in movie production was color film. Even before color was a possibility in movies, early film makers were interested in how color could enhance their stories. Early techniques included hand tinting: painting each frame by hand. Cheaper and more widely used was toning: dying the film in a signal color, used in a large number of films in the 1920s. The film processing lab Technicolor developed the Three-Tone coloring technique that became the standard for color film. It was a complex, time consuming, and expensive process that many movie studios were not eager to try. One of the early adopters of the three-strip process was Disney. Some of the most notable films Technicolor processed with three-strip were The Wizard of Oz and Gone with the Wind. Digital Video (or DV) has quickly changed how most films are made. First used to create special effects and animated movies, digital cameras became more common on film sets in the late 1990s. In 2002, George Lucas' Star Wars: Episode II – Attack of the Clones became the first major feature-length film to be shot entirely on digital cameras. [dead link] The ability to instantly play back footage and quickly transfer footage to computers for editing helped to speed up post-production time. Digital film making was given a big boost in 2005 when the Digital Cinema Initiative created a guide for manufacturers to create a universal standard, to make the technologies more compatible with each other and more user friendly. Shooting movies on digital also led to new technologies for distributing films. Titan A.E., released in 2000, was the first feature film to be released for viewing over the internet. Digital distribution changed the ways people received and watched media. It also gave viewers access to huge amounts of online content on demand. ^ "FAQ". British Film Institute. Retrieved 27 August 2018. ^ "The Story of the Kelly Gang (1906)". Australian Screen. Retrieved May 26, 2014. ^ "SCREEN ACTORS GUILD LETTER AGREEMENT FOR LOW-BUDGET THEATRICAL PICTURES" (PDF). Screen Actors Guild. Retrieved May 26, 2014. ^ Charles Musser, The Emergence of Cinema: The American Screen to 1907, pp. 197–200. ^ "Inauguration of the Commonwealth (1901): Education notes". Australian Screen. Retrieved 8 January 2019. ^ "Inauguration of the Commonwealth (1901)". Australian Screen. Retrieved 8 January 2019. ^ Passion Play" (1903), in: The American Film Institute Catalog of Motion Pictures [online database]. ^ a b c Patrick Robertson, Film Facts, New York: Billboard Books, 2001, p. 9. ISBN 0-8230-7943-0. ^ Patrick Robertson, Film Facts, New York: Billboard Books, 2001, p. 13. ISBN 0-8230-7943-0. ^ Charles Urban, A Yank in Britain: The Lost Memoirs of Charles Urban, Film Pioneer, The Projection Box, 1999, p. 79. ISBN 978-0-9523941-2-9. ^ Patrick Robertson, Film Facts, New York: Billboard Books, 2001, p. 10. ISBN 0-8230-7943-0. ^ a b c Patrick Robertson, Film Facts, New York: Billboard Books, 2001, pp. 10–14. ISBN 0-8230-7943-0. ^ Patrick Robertson, Film Facts, New York: Billboard Books, 2001, p. 12. ISBN 0-8230-7943-0. ^ a b American Film Institute Catalog of Motion Pictures [online database]. ^ Patrick Robertson, Film Facts, New York: Billboard Books, 2001, p. 15. ^ Carringer, Robert L (1979). The Jazz Singer. Wisconsin: Univ of Wisconsin Press. p. 17. ISBN 978-0299076641. ^ Parkinson, David (18 April 2012). "100 Ideas That Changed Film: Sound". Credo Reference. Laurence King. Retrieved 21 October 2016. ^ a b c d Parkinson, David (18 April 2012). ""Color" 100 Ideas That Changed Film". Credo Reference. Laurence King. Retrieved 21 October 2016. ^ Kroon, Richard W. (2010). ""Technicolor." A/v A to Z: An Encyclopedic Dictionary of Media, Entertainment and Other Audiovisual Terms". Credo Reference. McFarland. Retrieved 22 October 2016. ^ a b c d Parkinson, David (2012). ""Digital Video." 100 Ideas That Changed Film". Credo Reference. Credo Reference. Retrieved 24 Nov 2016. ^ a b Kroon, Richard W. (2014). "Digital Cinema; A/v A to Z: An Encyclopedic Dictionary of Media, Entertainment and Other Audiovisual Terms". Credo Reference. McFarland. Retrieved 24 Nov 2016. ^ Curtin, Michael; Holt, Jennifer & Sanson, Kevin (2014). Distribution Revolution : Conversations about the Digital Future of Film and Television. Berkeley, US: University of California Press. p. 165. ISBN 9780520959088 – via SFC Library Online. This page was last edited on 28 February 2019, at 11:08 (UTC).